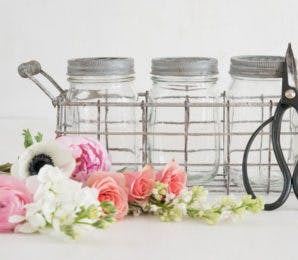 If you’re still searching for that elusive Valentine’s Day gift for the one you love then here are 4 gorgeous gift ideas for you. Personalised Valentine’s Day gifts are extra special because they allow you to say what you feel in a lasting way. Give Personalised Valentine’s Day gifts with your own words, that will be treasured forever. A monogrammed his or hers leather ring box, your own words of love etched onto a glass photo frame, a personalised compact mirror, or a fairytale glass jewellery box with their initial on the top and your own personal message on the front. 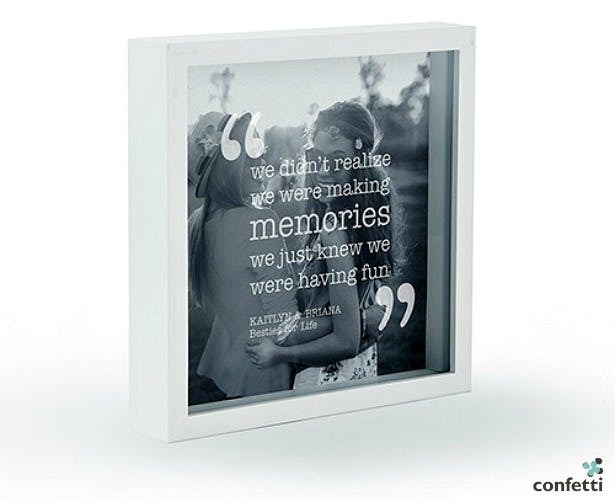 If ‘a picture says a thousand words’, this contemporary photo frame means you can go one better and add your words in too.Have your personalised caption etched directly onto the glass, an extra special moment will be captured for all time and become a piece of art like no other. This distinctive vintage style jewellery box with its bevelled glass panels and aged metal reflects the light and will add beauty to any dressing table. 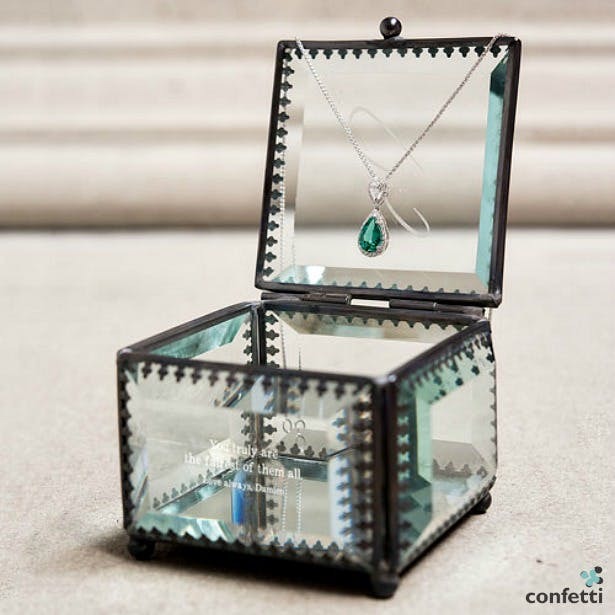 A real statement piece for your bedroom, the elegantly glass box is so small it could be used as to hold your wedding rings on your big day. 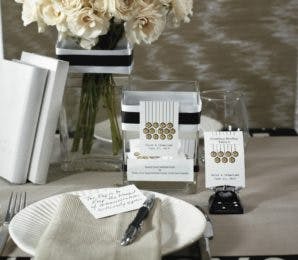 Make it personal with the addition of a monogram or a sentimental message of love. 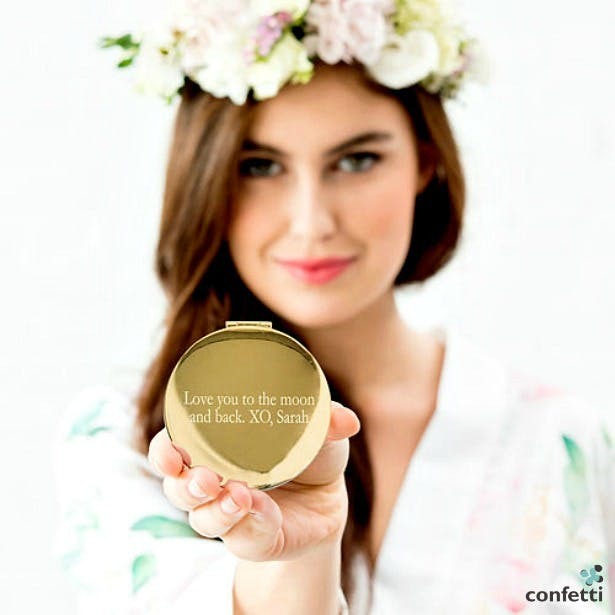 Give a designer compact mirror with her initial on the front and your own message engraved on the back. It’s something she can carry with her every day, even your wedding day. 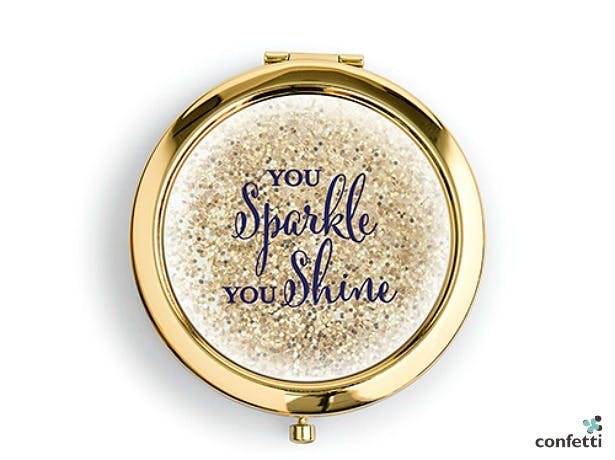 These compact mirrors are available in different colours and designs, in gold, silver and rose gold with a choice of several 3-D personalised designs including ‘You sparkle you shine’ and ‘Hello there gorgeous’. 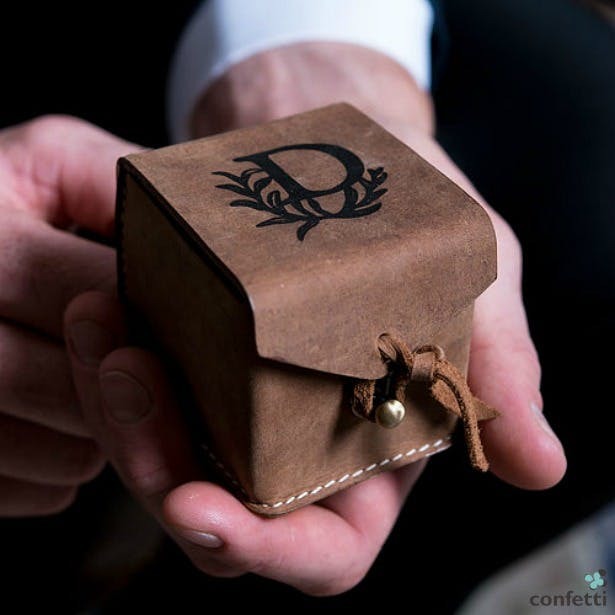 This stylish real tanned leather ring box is a classic his or hers design which can be personalised with your monogram and either used to store your ring at night or presented on your wedding day. For more stylish personalised Valentine’s Day gifts for the man or woman in your life please visit the Confetti shop. 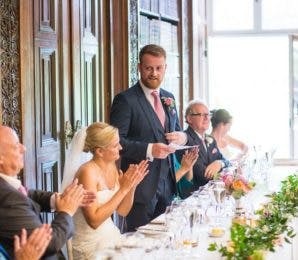 Confetti.co.uk is the UK’s biggest wedding accessories retailer and the ultimate resource for planning a wedding. Launched in 1999, the brand is a trusted favourite amongst brides-to-be and those involved in planning a wedding. 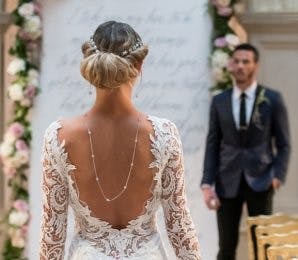 Their annual Win Your Wedding competition is the highest valued wedding competition in the UK, offering one lucky couple the chance to have a celebrity-worthy wedding free of charge. The competition is free to enter and open to UK residents over the age of 18 years old.